September 04, 2013 / Steve Black Jr. In a surprising twist announced this morning during a special Nintendo Direct presentation, Pokémon X and Pokémon Y players do not receive Chespin, Fennekin, or Froakie from Professor Sycamore but are in fact given the choice of a classic partner Pokémon—Bulbasaur, Charmander, or Squirtle—from the very first Pokémon games, Pokémon Red and Pokémon Blue! Adding to the excitement, once a player has evolved this Pokémon into Venusaur, Charizard, or Blastoise and obtained its unique Mega Stone, the Pokémon will be able to Mega Evolve while in battle.Mega Venusaur, Mega Charizard, and Mega Blastoise will possess overwhelming powers never before seen in a Pokémon game. Players can choose fan favorite Bulbasaur, Charmander, or Squirtle whenPokémon X and Pokémon Y launch worldwide October 12, 2013, for the Nintendo 3DS family of systems. More secrets about Mega Evolution were also revealed today. It was previously announced that certain Pokémon needed to hold a unique Mega Stone in order to Mega Evolve, but now it’s known that there is a second requirement players must fulfill for Mega Evolution to occur. Trainers must also obtain a bracelet called the Mega Ring that holds a mysterious stone called a Key Stone. The Trainer’s Key Stone resonates with the Mega Stone held by his or her Pokémon, and together they trigger the Evolution that is normally impossible—Mega Evolution. Also announced in this morning’s Nintendo Direct presentation were details for the North American release of two special Nintendo 3DS XL hardware designs featuring imagery from Pokémon X andPokémon Y. 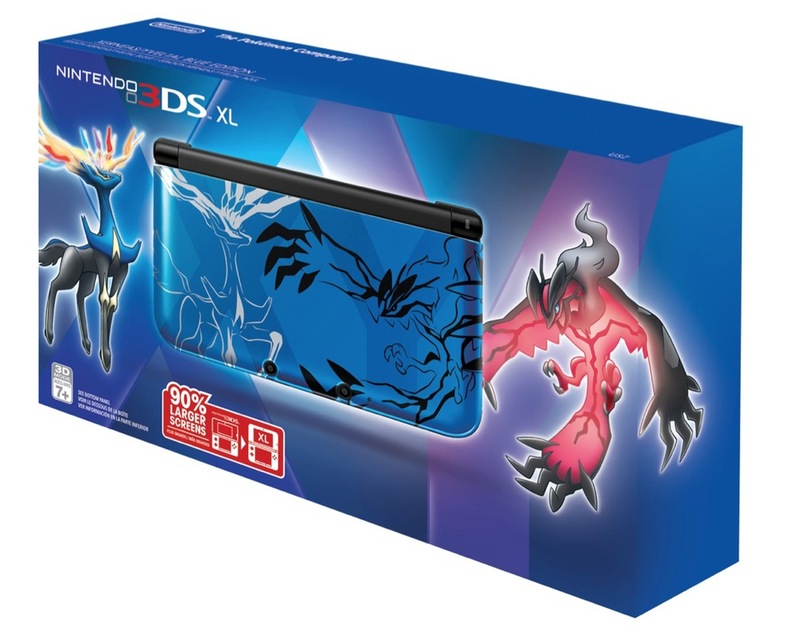 These systems come in Red or Blue and feature brand new Legendary Pokémon Xerneas and Yveltal. The systems will launch on September 27 at a suggested retail price of $199.99 each. To view the Nintendo Direct presentation in its entirety, visit http://www.nintendo.com/nintendo-direct. For more information about Pokémon X and Pokémon Y for the Nintendo 3DS family of systems, including new images and gameplay video featuring information announced today, please visit Pokemon.com/XY. Pokémon X and Pokémon Y will be sold at major retailers and digitally on Nintendo eShop. Be sure to check out Pokemon.com, Like the official Pokémon Facebook page at Facebook.com/Pokemon, and follow Pokémon on Twitter @Pokemon to ensure you’re receiving the latest Pokémon X andPokémon Y news! Pokémon Bank! Store Your Love!